As someone who uses Google Hangouts for both personal and work related correspondence, I've always been frustrated that the only viable options for using it are to install Chrome and use the Hangouts extension, or to use the outdated looking interfaces on Google+ or the Hangouts website. With Hangouts becoming a product that extends to messages, phone calls, video conferences, and even the default SMS app on many Android devices, it really felt strange that its web presence seemed so neglected, and felt confined to just being a sidebar on other Google sites. 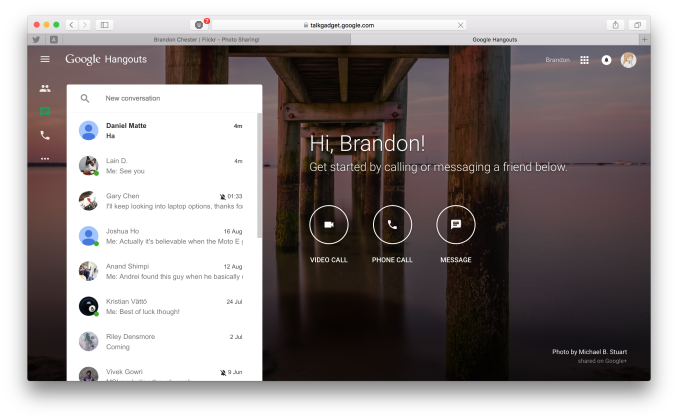 Today that has changed with Google's revamp of their dedicated Hangouts website. While the new website wont satisfy users who still want a dedicated Hangouts application for their computers, it's a much nicer experience than using it through Google+ or the old website. The page background rotates through a gallery of images from Google+ users, and the interface itself is instantly familiar to users who use the Hangouts application on the iOS or Android devices. Although the page has a Material Design inspired interface, the chat windows themselves have the same old Holo appearance, and really fit poorly with the rest of the site. Hopefully an update to the chat windows is something Google has planned for the near future. Anyone who wants to try out the new Hangouts website can do so by visiting the new web page here. Yup, the same (conversation) widget is available in gmail.